Quinta de Santa Luzia is a historic stately home set within the grounds of a vineyard from which some of the Blandy wines are still produced. 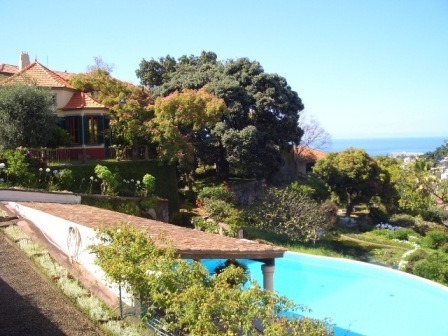 It occupies a priveleged hillside location with panoramic views of Madeira and the ocean. The extensive mature gardens provide a peaceful location and the stately home, cottage & bed and breakfast offer unique accommodation in luxurious surroundings. Quinta de Santa Luzia provides guests with the opportunity to experience the traditions of Quinta Culture. Quintas were traditionally agricultural estates that provided their own sustenance and the aim of Quinta de Santa Luzia is to provide guests with an opportunity to interact with the history and traditions of this somewhat forgotten cultural concept. Guests staying at Quinta de Santa Luzia have the opportunity to pick fresh herbs & vegetable from the gardens and explore the vineyard. Guests are welcome to enjoy the spacious grounds of a traditional working Quinta (farm or estate in Portuguese). Boasting fine views and luxurious interiors this historic property goes back to the 19th Century. Enjoy a continental breakfast of fresh bread, local jams and freshly squeezed orange juice. Quinta das Malvas offers bed & breakfast accommodation comfort & privacy at very affordable rates. The main house at Quinta de Santa Luzia is a beautifully decorated villa surrounded by private mature gardens. The villa has panoramic views of Funchal and the Ocean. It is part of the estate but enjoys the luxury of a private swimming pool. The spacious rooms such as the billiard room make the villa the perfect self catering accommodation for families. Guests staying in the main house are also welcome to explore the Quinta and to pick their own fresh herbs & vegetables. Casa do Feitor is a charming cottage holiday rental set within the midst of the Quinta. Totally independent, with its own entrance and private gardens, the cottage is a 5 minute walk to the main house. Tastefully decorated with all the conveniences of modern living. Guests staying in the cottage enjoy the use of the tennis courts at the Quinta and are also encouraged to wonder around, experience Quinta culture and make use of the fresh produce available.